The earliest reference we have found to the house being called ‘Rosemount’ is the 1871 census. It is interesting to note that as late as 1877 it was being called ‘Rosemount Cottage’ in trade directories. In the 1841 census the property was called ‘Spanns Cottage’ and this name was still being used in the census enumerator’s route description for the 1881 census. We are not sure when the house was built in its current form. Keith Long who bought the house in 1998 wrote a little document about the ‘Collings’ clock currently displayed in the Town Hall and which had previously stood in Rosemount for many years. He referred to a note found inside the clock giving its date as ‘1836 the same year that the house was built’. The note was signed by John Chambers who bought the clock for use in his home at Rosemount and so Keith believed that the date must refer to when Rosemount was built. This is supported by other sources which refer to the style of the house being ‘early 19th century’. The privies at Rosemount House featured in a talk we attended on ‘Down the Garden Path.’ The talk included photos of some marvellous outside lavatories which were divided by a wall to separate the servants’ facilities which were rather basic with white washed walls from the family’s which were in a comparatively ornate place with arched door and painted glass windows. We are sure that segregation of this sort was not uncommon in houses of this nature and do not want to imply that the owners of Rosemount were more than usually snobbish. It is an interesting aspect of life of that time. We are aware of the fact that John Chambers was not born until 1844 and did not purchase Rosemount until 1875. However we assume that Rosemount was ‘reconstructed’ in 1835 when the occupant, William Snook died, to provide a home for the owners, the Barrows. Click here to read about the early history of the property. The Barrows – on 7th January 1805 Elizabeth Knapp, the daughter of Robert and Jane Knapp, married John Barrow at Rockhampton Church. Their home was at Shepperdine. They had at least three children: Thomas Cox Barrow baptised on 26th December 1805 at Rockhampton, Jane Barrow baptised there on 27th October 1806 and Sarah Frances Barrow (who birth we haven’t traced but she is shown as John Barrow’s daughter aged 42 on the 1851 census). Elizabeth then died at the age of 34. She was buried in Rockhampton on 4th December 1815. In 1818 the property was left to Sarah Frances Barrow by her aunt, Jane Knapp (see above). The land tax records from 1819 up to 1831 were still showing the house was owned by ‘Late Jane Knapp’ and occupied by William Snook. William Snook died aged 68 and was buried in Thornbury on 1st April 1835. We suspect his wife had been Mary Snook who died aged 58 and was buried on 12th June 1819. If the date of ‘1836’ referred to above is correct, then it would appear that the re-construction of the property took place following it being vacated by William Snook. After that time the Barrow family used it as their own residence so it would appear they built something grander for themselves, although in 1843 in the announcement of the wedding of Jane Barrow, the property was still called ‘Spann Cottage’. The 1841 census shows John Barrow aged 65 living at the house with Jane aged 50, Sarah aged 27 and Sarah Meredith a female servant aged 47 and Frances Olive another female servant aged 16. The 1851 census shows John Barrow a widowed annuitant aged 77 from Woolaston was living there with his daughter, Sarah F Barrow aged 46, a landed proprietor from Thornbury and a general servant Hannah Smith aged 13 from Thornbury. Of the three children, Jane married Thomas Garrard, a widower and a gentleman from Bristol on 15th September 1846. The Bath Chronicle in announcing this wedding described Thomas Garrard as “Chamberlain of the City of Bristol.” Thomas Cox married Mary Ann Povey at Henbury on 26th December 1831 and they went to live in Frenchay. Sarah Frances never married. She remained at home with her parents until they died. The 1861 and 1871 census shows Sarah living in Bath with her widowed sister, Jane Garrard. In the 1871 census they were living at 8 Springfield Place, Lansdown in Bath, a property which appears to have been left to Sarah Frances by her spinster aunt, Sarah Barrow in her will dated 6th January 1852. John Barrow died aged 81 and was buried on 28th February 1855. The 1859 Rate Book shows the house was occupied by ‘Mrs Moore’. She was living in Bristol in the 1851 census by which time she was already a widow. The 1861 census shows that it was occupied by Elizabeth Moore, a fundholder aged 70 from Bristol and Mary Wisse? an unmarried boarder who was another fundholder aged 60 from Bristol. There were two servants: Sarah Brimble, a cook aged 19 from Hanham and a housemaid, Hester Harris aged 19 from Alveston. In the 1871 census the house was occupied by Elizabeth Moore, a gentlewoman aged 80 from Bristol. She was looked after by three servants, Maria Plumley, a widowed nurse aged 60 from Somerset, Maria Cullimore an unmarried cook aged 25 from Tytherington and Eliza Maynestone a housemaid aged 22 from Thornbury. The records of the Society of Friends at Bristol Records Office show that Elizabeth died aged about 75 and was buried in the Friends Burial Ground at Frenchay on 29th March 1875. We understand that there is a headstone to the grave although we haven’t seen it. In 1875 Sarah Frances Barrow sold the property to John Taylor Chambers for £1200. Sarah died on 25th April 1876 at her home at 8 Springfield Place, Lansdown. United Bristol Healthcare Trust – when Maurice Chambers died in 1944, his will arranged that the house should be used for the benefit of the Bristol Royal Infirmary, although he made provision allowing his wife and brother to live in the house during their lifetime. After the formation of the National Health Service, the United Bristol Healthcare Trust took ownership of the property, but by the time that Cicely Chambers died in 1995 the house was not required for use by the Hospital Trust. In 1998, they arranged for it to be sold and the proceeds used to benefit the Infirmary in the way that Maurice directed. Keith Long – we understand that Keith had been the landlord at the Knot of Rope (formerly the Exchange). In 1998 he bought Rosemount at auction. 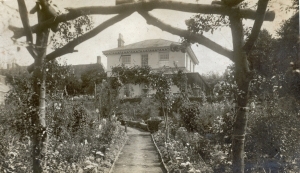 The house and garden required major work and modernisation. The current owners, Gina and Ira de N’yeurt, took over the house about 2007 when they moved from London and they set about restoring the house and the garden to its former glory.